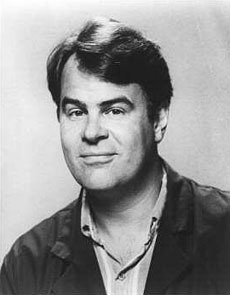 As a young man, Dan Aykroyd was a postal worker. His first success on the verge of show business came in 1972, when he produced, wrote, and appeared in Change for a Quarter, a no-budget 15-minute cable comedy show. Later that year he was invited to join the Second City comedy troupe in Toronto, where he stayed through 1974. After that, Aykroyd was an original Not Ready for Prime-Time Player on NBC's Saturday Night Live, alongside Chevy Chase, Garrett Morris, Laraine Newman, Jane Curtin, Gilda Radner, and Aykroyd's best friend from Second City, John Belushi. On Saturday Night Live, Aykroyd did impressions of Richard M. Nixon, Jimmy Carter, and Julia Child. He was the patriarch of The Coneheads, and a wild and crazy guy alongside Steve Martin. But Aykroyd is best remembered from SNL as Elwood Blues. Aykroyd always sincerely loved the blues. As a teen, he once jammed with Muddy Waters, when Aykroyd attended a show and Waters's drummer, S. B. Leary, disappeared into the men's room for half an hour. Young Aykroyd drummed for two songs, and described it as a dream come true. Later in life, Aykroyd's financial contributions helped launch the House of Blues chain. Viewers first heard the Blues Brothers on SNL on 17 January 1976. Paul Shaffer was the duo's musical director, so it sounded good. After that, Aykroyd & Belushi often warmed up the audience as the Blues Brothers before SNL telecasts, even on nights when the Blues Brothers weren't in the show. In 1978, they opened for Steve Martin's stand-up act at the Universal Amphitheater in Los Angeles, toured as the Blues Brothers, and recorded their album, Briefcase Full of Blues. Aykroyd was co-writer of their hit movie, The Blues Brothers (1980). After Belushi's 1982 death, Aykroyd has said it was difficult to laugh, impossible to do comedy, and unthinkable to sing. He felt as if he had lost a real brother. At Belushi's memorial service, Aykroyd played a tape recording of "2000-Pound Bee", fulfilling a semi-joking promise Aykroyd & Belushi had made to each other. Aykroyd has since resumed being funny, and even sang in the ill-advised Jake-free sequel, Blues Brothers 2000. Mostly, though, he has become a familiar character actor in his middle age. Aykroyd's better films include The Blues Brothers and Neighbors (both with Belushi), Trading Places, GhostBusters, and a string of flops like Coneheads and Nothing But Trouble. In most biographies, Aykroyd is listed as twice married and the father of six. His purported first marriage, however, (to one Maureen Lewis) never happened, and the three sons (Mark, Lloyd, and Oscar) who came from that union never existed. Many years ago, as Aykroyd first became famous, the publishers of Who's Who sent him a blank questionnaire, but Aykroyd bridled at being asked to list all his biographical information. So he made up a phony biography, with a phony wife and three phony children. Referring to outdated editions of Who's Who, lazy reporters have mentioned his fictitious family ever since, as if they're factual. Says Aykroyd: "I will give 10 million dollars to anyone who can find that family and bring the three kids and the wife to me." Nothing But Trouble (15-Feb-1991) · J. P.